AdEase is proud to announce it has won three awards in the 2013 AVA Digital Awards. The AVA Digital Awards competition is an international competition that recognizes outstanding work by creative professionals involved in the concept, direction, design and production of digital communication. As part of the Know the Signs campaign, a multi-faceted suicide prevention campaign designed to educate about the warning signs of suicide, the website http://www.suicideispreventable.org earned a Platinum Award. Additionally, a :15 online video component of the Know the Signs campaign, earned a Gold Award in the Video for Web/Government category and Honorable Mention in the Creativity/Special Effects category. Winners were selected from over 200 categories in Audio, Video, and Web-based production. About 14% of the entries won the Platinum Award, the organization’s top honor. About 17% were Gold winners. AVA Digital Awards is sponsored and judged by the Association of Marketing and Communication Professionals (AMCP). The international organization consists of several thousand production, marketing, communication, advertising, public relations, and free-lance professionals. AMCP administers recognition programs; provides judges and rewards outstanding achievement and service to the profession. As part of its mission, AMCP fosters and supports the efforts of creative professionals who contribute their unique talents to public service and charitable organizations. Judges are industry professionals who look for companies and individuals whose talent exceeds a high standard of excellence and whose work serves as a benchmark for the industry. Founded in 1999, AdEase is a full service marketing, advertising and public relations agency committed to building brands while providing measurable return on investment. With offices in San Diego, Los Angeles, and Sacramento, AdEase executes targeted marketing campaigns through a variety of services including online marketing, social media, SEO, television, radio, out-of-home, public relations, web development and design. 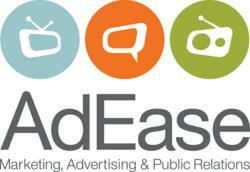 AdEase specializes in marketing for the financial, hospitality, education and government sectors. For more information, visit http://www.adease.com.